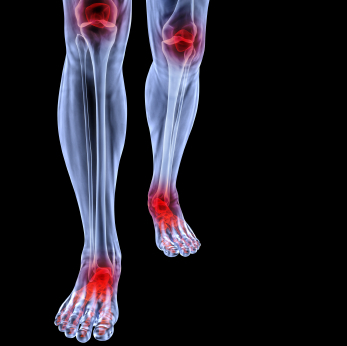 Causes, symptoms and treatment of foot arthritis. Foot arthritis is very common, as it is more noticeable in the weight bearing joints, and can reduce mobility if left too long without treatment. Prevention of foot arthritis and deformity is very important and must start in the early stages of the condition, to achieve the best results. By the age of 65 approximately 80% of us will have visable signs of osteoarthritis (wear and tear arthritis) on X-ray, but only 25% of people will experience symptoms. Automimmune conditions (e.g Rheumatoid Arthritis, where the bodys own cells attack the cartilage surrounding the joint. This results in imflammation and swelling and eventually destruction of the joint cartilage). Previous injury or surgery to the effected joint (e.g fractures, knee reconstructions). Age (cartilage becomes brittle with less capacity to repair itself and withstand pressure). Weight (increase strain and wear on the joint). Illness of infections (e.g septic arthritis, osteomylitis, gout). Occupation, as joint position and strain on joints varies between different jobs. Arthritis in the feet can cause deformity or bony prominence resulting in pressure and irritation. Generalised aches in the feet (more severe in colder weather). Stiffness of big toe joints. Bunions, clawed toes and other toe deformities. Callus, corns or even ulceration. Customised foot orthoses to provide comfort and support to the joints in the feet. Surgical option (joint replacement/ fixation of joints). Gentle, no weight bearing exercises (hydrotherapy, cycling). Anti-inflammatories or alternative pain relief. Foot arthritis is a common cause of foot pain frequently encountered by podiatrists. If you are experiencing any of the above symptoms do not leave it to get worse, book an appointment with us today.